Caracol Guided Tour - "Our Belize Vacation"
Located on the western edge of the Maya Mountains wihtin the Chiquibul Forest Reserve, Caracol sits high on a platueau, some 500 meters above seal level. Remnants of extensive terraced hillsides give evidence of an intensive farming industry that once provided sustenance for a large population. An internal road system made up of over 60 kilometres of sacbeob (or roads) and causeways served as routes for transportation and communication.The social organization of Caracol included all levels of society from poor farmers to powerful elite individuals. A "middle class" also constituted a large portion of the community. Shell workshops were found in residential areas, where it is believed, that artisans once engaged in specialized craft production. The system of causeways served as market routes along which materials and goods where acquired from local and regional sources. Reseach indicates that Caracol may have had a population of about 100,000 at one time. The metropolis city, replied on an independent system of social and economic networks of craft workshops and extensive farms, to maintain its vitality. To create a vibrant community, visionary leaders, artists, engineers, all worked together. Today, Caracol lies in ruins, but the people who once lived in this city, left a lasting impression on the physical and cultural landscape that we now know as Caracol, Belize. At the eastern section of the site, served as an astronomical observatory for the community. At the centre of this group of ruins, is a Temple of the Wooden Lintel. This structure has several construction phases with original zapote wood crossbeams dating part of the visible building phase to the late pre-Classice (1st Century AD). It is believed, that the earliest construction dates to 300 BC, and the building was used until about AD 1100. At the sunmit of one of the buildings in this area, is a Stela, which has the longest glyphic text in Belize. This stela was dedicated during the reign of Lord K'an II in the seventh century. Another building in this area, has a tomb inside that dates to AD 696. South of this astronomical observatory section of the site, is a ballcourt marker which was dedicated in AD 633 by Lord K'an II. The text records indicate, that K'an II's father, Lord Water, engaged in two wars with Tikal in AD 556 and 562. It also decribes K'an II's defeat of Naranjo in AD 631. In the center of the side is an acropolis, this elite residential group of ruins, in its final Late CLassic form, contained ritual and residential buildings. A royal tomb at the base of the northern structure contained the remains of four individuals and 20 pottery vessels. A painted test dated the tomb construction to AD 582. To the north of the site, is a massive architectural complex comprised of Caana, a ballcourt with several plazas, a water reservior and an elite residential complex known as Barrio. Barrio was an elite residential plaza containing three palaces and a family shrine. Caana, meaning "sky place", with this ruin rising some 43 meters and is one of the tallest human-made constructions in Belize. Consisting of four residential complexes and three shrines, this is one of the most elaborate architecural complexes known from the Classic period in the Southern Maya Lowlands. Rooms on the summit probably housed the royal family compound. A large elaborate tomb was found at the summit of this Caana. The tomb contained the remains of a woman, found in a way that suggests that she was burried in an upright position, or in a bundle. The remains may be those of Lady Batz' Ek who married the ruling dynasty of Carocol in AD 584. Hireoglyphs painted inside the tomb record a date in AD 634. This probably does not represent the date of Lady Batz Ek's death. But more likely describes the interment or burial that took place several years after her death, as recorded on monuments commissioned by her son, Lor K'an II. TO the south of the site, is another acropolis, an additional elite residential complex consisting of several plaza groups at the southern end of the site core. One cremation burial and several tombs have been excavated from this area dating at AD 450-650. The human-made reservoirs served as the only known water sources at Caracol. They were raised and plastered for efficient catchment and storage of water. The smaller of the two central reserviors (or aguadas) is to the southwest of the B Group. A second, larger reservior is located just north of the South Acropolis. The third acropolis, or notherwest acroplosi is made up of several plaza complexes set into the hilltop, northwest. This residential area is joined to the city centre by a causeways. A tomb was found at the back, holding a chamber filled with many human bones (at least 24 individuals). Many of the bones and grave goods show signs of having been burnt. The Caracol site was found in 1939 by mahogancy hunter, Rosa Mai. The year and named it "Caracol" (Spanish for snail). In recent years, the emblem glyph (a hieroglyphic site identification symbol) has been translated to mean Oxwitza or place of three hills (or three acropolis mounds). Another glyph sometmes used to identify the site is K'atumak, an exalted royal title. In 1950, Linton Satterthwaite (Univeristy of Pennsylvania) excavated and recovered 32 stones monuments within five plazas. Satterhwaite mapped the central area of the site and discovered two causeways. A. H. Anderson, the first Archeolgocial Commissioner of Belize, carried out minor excacations during the mid 1950's. In 1978-79, Paul Healy from Trent University Invesitaged argricultural terraces that extend three kilometres from the site core. From 1985 to 2005, the Caracol project, under the direction of Arlen and Diane Chase of the University of Central Florida, has undertaken major exvacations and surveys that reveal a massive central core, and dense continuous settlement extending out over a radius of eight kilometres. 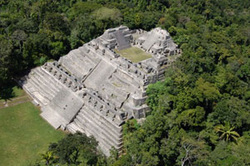 Most of the excacation and conservation of the monumental archeitectural was conducted by the Belize Tourism Development Project under the coordination of Jaime Awe from 2001 to 2004.